We were contemplating what to eat on Juan’s spontaneous Saturday off, pretty much all day. He dropped the idea of Tahu and I wasn’t really feeling it but I am glad, I did come around to going. According to their website, “Tahu is a Spanish inspired restaurant and bar with a Caribbean twist. 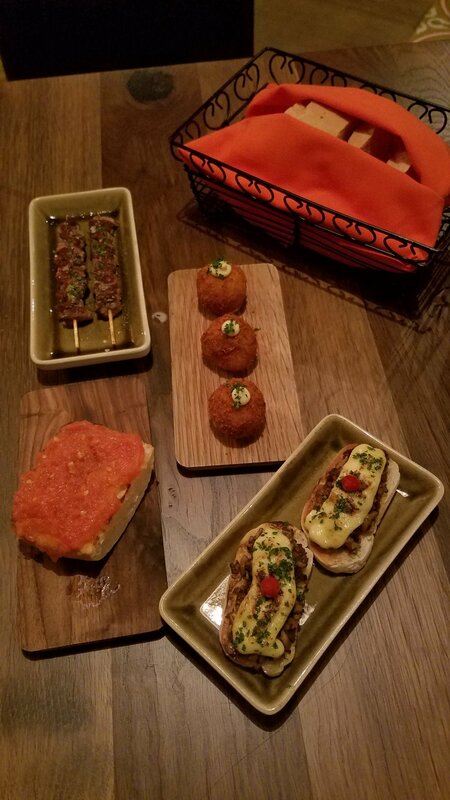 Featuring a tapas style menu with small plates, authentic stews and paella’s, handcrafted sangrias and cocktails. The perfect environment to wine, dine and relax,” and it was nothing short of their description. From the orange walls, limited seating, the handwritten specials board, comfy leather chairs, bright orange napkins, the Spanish floor tiles and Spanish playlist; it truly had an inviting ambience. I definitely felt like I was in another country within the restaurant and I find that it hard to do in Cayman. I always have felt that some spaces/restaurants try a bit too hard and the execution feels rather tacky than authentic. In my personal opinion, the simplicity of the deco, and bright colour scheme works extremely well for Tahu. Plus, I guess it did help that we went around 8 pm. Each of our choices didn't disappoint. Every dish was bursting with flavour. What I thoroughly enjoyed about Tahu is that they make simple ingredients come alive. The Pan con Tomato simply put is bread and tomatoes. It was perfectly toasted bread spread with with tomatoes, olive oil, garlic & salt. Mushroom Montadito - toasted bread, sauteed mushrooms, truffle aioli and piparras. Just look at the torched aioli! How could you not order a second round? 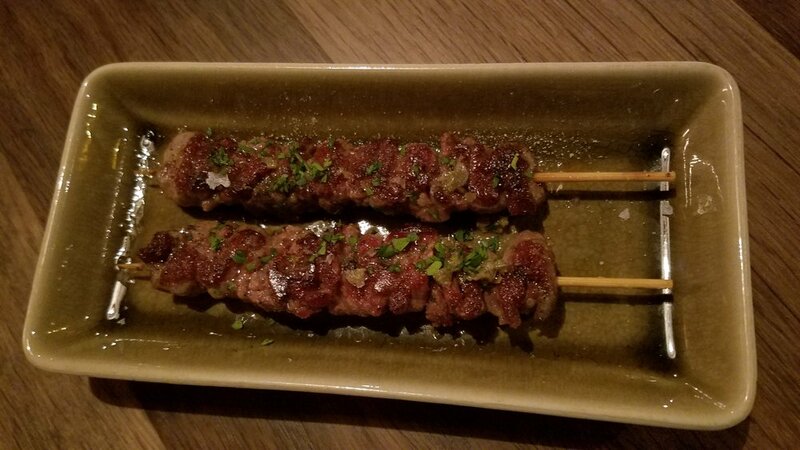 Beef Skewers - olive oil, parsley, salt and garlic. The Beef was very tender and well balanced. It was good choice but not something I would rave about or recommend. Maybe that was because I feel that everything lacked a pinch extra of salt....maybe it's just me tastebuds. Love the decor from the floor tiles, the communal table and the little table lights! My overall experience are Tahu was exceptional and my favourite things from our choices were, the Mushrooms and the Gambas! We even ordered a second portion of the Mushrooms…I think that speaks for itself! P.S. I adore their logo. Take a closer look. Can you see the sword?